We see people around us who have bent pinky fingers some have more bent fingers then others; it is a medical condition and is commonly known as Camptodactyly. Usually people suffering from Camptodctyly have ancestors whose fingers are bent and that explains it being a hereditary condition. The condition Camptodactyly is explained as a flexion deformity (disfiguration) of the finger. 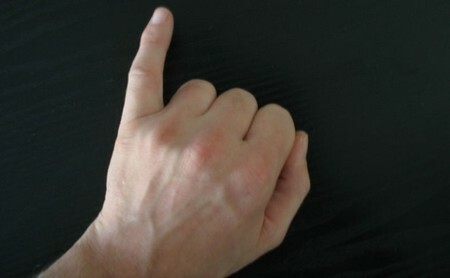 People who have Camptodctyly syndrome have one or more bent fingers that cannot be straightened or extended completely. Camptodctyly is found to be a congenital condition which means that it is present at birth. Antthropathy-Camptodctyly is a disorder that affects a joint. Usually children who have the Camptodctyly syndrome also have swollen knees and ankles and at times complain having hip pain. It has also been found that patients of Camptodctyly have problems with the sac that surrounds the heart and is known as pericardium. Patients can be and are being relieved of this problem by a surgical procedure called pericardiectomy in which the pericardium is removed. There are several causes of Camptodactyly or generally speaking bent fingers. The presence of a number of different abnormal structures in the finger may also be a cause. It may be due to the tightening of the skin or may be due to tendon and ligament contraction. Abnormal muscles and irregularly shaped bones may also be one of the causes. Some of these above mentioned causes are obvious and some are not, it varies from one patient to the other. The exact occurrence of this condition in general population is still not known, but according to an estimate it affects 1% of the general population, however this estimate might not be accurate for the present time. This disease is generally found in infants or adolescents. Camptodctyly syndrome is most often found in children whose parents have a blood relation. It has also been found that this disease affects the female population more than the male population. It is due to the Camptodtyly syndrome that the proximal interphalageal joint of the smaller finger is most commonly affected. It is not epidemic in most cases; some patients might have family history. Camptodactyly may also occur as a part of an underlying syndrome. So far almost 2000 cases of Camptodctyly have been diagnosed. The countries where these cases have been diagnosed are Canada, India, Mexico, Turkey, Pakistan, Saudi Arabia and Newfoundland. Common people cannot and should not diagnose Camptodactyly on their own unless it is diagnosed by a physician after a thorough physical examination. X-rays are strongly recommended in such cases. Patients can be treated with occupational hand therapy or splinting in mild cases whereas in severe cases surgery is always an option. Fingers in such cases are generally kept mobile by removing the tendon sheaths in the affected fingers. The mobility of other such joints e.g. knees is also maintained by removal of the membranes surrounding the joint.